At our house we have a book reading tradition that is near and dear to my heart. At the beginning of the month of December I wrap up 25 books and place them in a basket under the Christmas tree. Each night one of my kids picks a book and we all snuggle up together and read it by the light of the Christmas tree. This year we are shaking it up a little bit and making the weekends even more magical by adding some fun in the kitchen. I received compensation and samples for this post. All opinions are my own. Each week in December we are going to make a special Christmas treat in the kitchen, whip up some hot chocolate and really get comfy in that beautiful glow of the tree. Slippers, Pjs, blankets, the works! Quality time spent with my kids is precious to me. Each year seems to rush by quicker than the last, and I know that my time under the tree reading to them will soon be a treasured memory. Okay, I know this book is not a holiday book, but my kids think it is HILARIOUS! Just like most dads, Jimmy Fallon was determined that his baby’s first word would be “dada”! He had to work very hard for it, and the animals in the book are no different. My kids love do all the animal sounds and it makes my 8-month-old laugh so hard. Your Baby’s First Word Will be Dada! is just so much fun to read. Written by the same author who created On The Night You Were Born, another family favorite, The Spirit of Christmas is the perfect book for introducing the best parts of Christmas to your little ones. Its beautiful illustrations depict all of the classic parts of the holidays and remind us that even with all the hustle and bustle, the most important part of the season is being with each other. The Spirit Of Christmas is a must for kicking off your holidays! Mr. Fish is back with a magical holiday message that every child needs to learn. As Mr. Fish thinks and plans gifts for everyone on his list he becomes stressed and overwhelmed, sound familiar? He quickly learns that the best gifts come from the heart, they don’t need to be big, or bright, or have bling-zing. I would love for my kids to learn this lesson at a young age, and The Not Very Merry Pout-Pout Fish is perfect for opening that dialogue with them. The snow is piling up outside and and the town tree lighting is in danger! Where are Sibley the Workhorse, Farmer Bill, and the town Christmas Tree? It is up to Tractor Mac to to brave the blizzard and rescue all of his friends in Stony Meadow Farm. 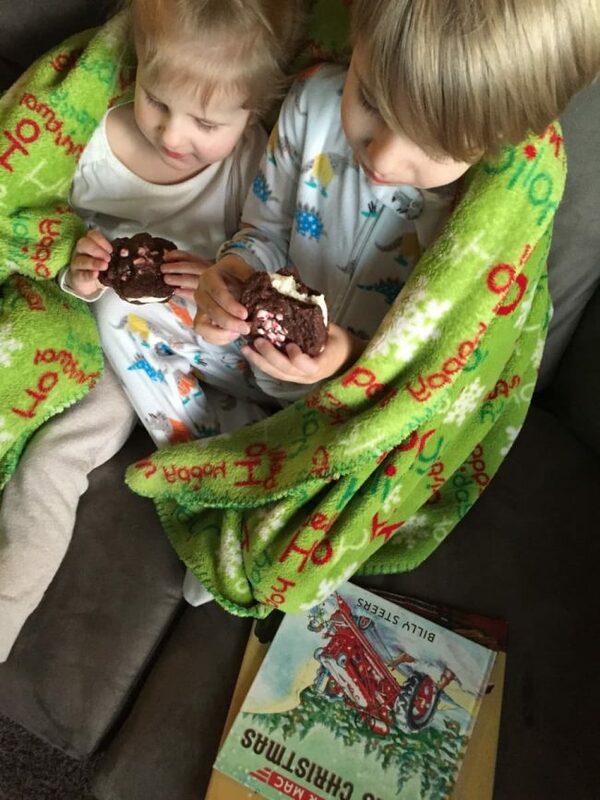 A favorite series of readers young and old, Tractor Mac Saves Christmas is fun for the whole family! Beat butter, sugar, eggs, vanilla and peppermint until light and fluffy. In a large bowl stir together flour, cocoa powder, baking soda, and salt. Slowly add flour mixture to butter mixture until well combined. Use cookie scoop to drop cookies onto ungreased baking sheet. Press candy cane pieces on top. Cool slightly then transfer to wire rack to cool completely. Mix butter and marshmallow creme until smooth, add powdered sugar and vanilla. Spoon onto cookies and top with another cookie! Sound yummy!? Believe me, they are. The holidays are upon us! Start baking and get reading! Which of these amazing books would you use to kick of your Books and Baking Tradition? 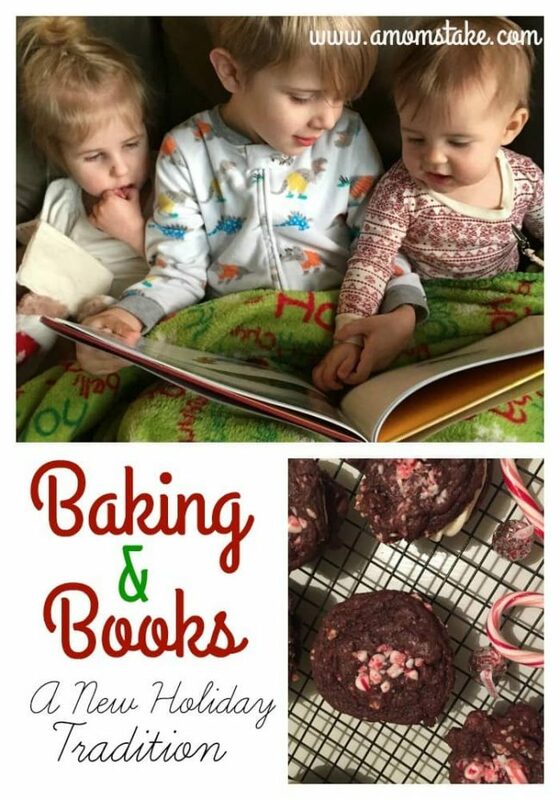 What a fun way to spend quality time together: books and baking for the holidays. Your cookies look yummy and I look forward to making your recipe. What a cute family tradition. The cookies look so yummy! This is a super cute tradition! I would love to start something similar with my son and daughter. I was just saying to someone the other day that books, baking, and ornament making sum up our holiday traditions very well. I love your book suggestions and those cookies look amazing! This sounds like a great tradition. I love to bake and these cookies look so delicious. I will have to try the recipe this weekend. Such wonderful traditions for your kiddos. 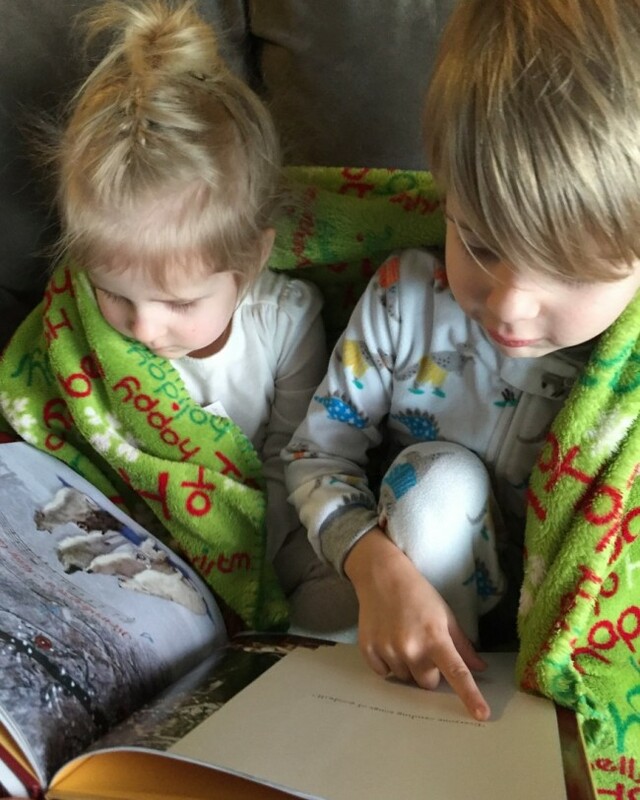 We did the books one year and my kids have requested a repeat…. Definitely think we need to do that. I like this little tradition, and the Pout Pout Fish book looks just too cute not to get. Great book ideas! Awesome! We do something similar. We read a book a day for all 24 days leading up to Christmas. And we bake several times that month, too. I am always looking for new book ideas love these! I always get a few books for the Holidays. We love Pout Pout Fish, I had no idea there was Christmas version! Those sandwich cookies look amazing too! This is such a fantastic tradition to create and share with your children! I love the recipe you shared too, must try to make it ! This sounds like a great tradition to me. The cookies sound so good and these are all great sounding books. What a great tradition! Everyone looks so cozy and happy reading together. Those cookies are to die for too. Yummy! What a fun tradition! I need to start something like this with my little one. That is a great tradition and I think I might steal it. They are going to have great memories the rest of their lives with this! Haha, those are some adorable holiday books- we might need to pick some up for a new tradition or two. The kids always love to help out with the baking around here. They even like to share their cookies with their teachers! I’ve been thinking about doing a 24 days of books in December with my kids. I need to stop slacking and get some books.